Human immunodeficiency virus, acquired immunodeficiency syndrome, human herpes virus 8, Kaposi sarcoma, carcinomatosis. Kaposi's sarcoma (KS) is one of the most frequent neoplastic diseases in patients infected with human immunodeficiency virus (HIV). 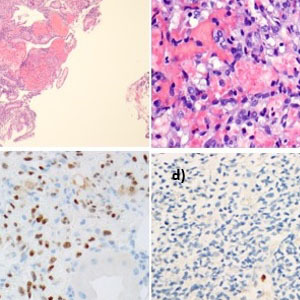 The authors report the case of a 40-year-old male with ascites, peripheral edema and peritoneal carcinomatosis secondary to a gastric KS related to human herpes virus type 8 (HHV-8). The patient had severe immunodeficiency, with a TCD4+ count of 86 cells/µl and newly diagnosed acquired immunodeficiency syndrome. His clinical condition rapidly deteriorated, with multiorgan failure, and he died without the possibility of initiating antiretroviral therapy or chemotherapy. To the authors’ knowledge, carcinomatosis is a rare feature in KS. Bhaijee F, Subramony C, Tang S, Pepper D. Human immunodeficiency virus-associated gastrointestinal disease: common endoscopic biopsy diagnoses. Patholog Res Int. 2011;2011:1-8. Ioachim H, Adsay V, Giancotti F, Dorsett B, Melamed J. Kaposi's sarcoma of internal organs. A multiparameter study of 86 cases. Cancer 1995;75:1376-1385. Toschi E, Barillari G, Sgadari C, Palladino C, Cristofaro A, Ciccolella C et al. The HIV-1 Tat protein cooperates with basic fibroblast growth factor in inducing vascular permeability and edema: implications for AIDS-associated Kaposi's sarcoma (KS) pathogenesis. J Acquir Immune Defic Syndr 1999;21:A19. Uldrick T, Wang V, O’Mahony D, Aleman K, Wyvill K, Marshall V et al. An interleukin-6–related systemic inflammatory syndrome in patients coinfected with Kaposi sarcoma–associated herpesvirus and HIV but without multicentric Castleman disease. Clin Infect Dis 2010;51:350-358. Krown S. Highly active antiretroviral therapy in AIDS-associated Kaposi's sarcoma: implications for the design of therapeutic trials in patients with advanced, symptomatic Kaposi's sarcoma. J Clin Oncol 2003;22:399-402.